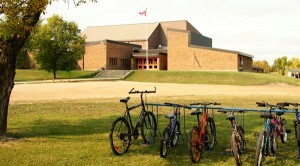 Daycare services and a nursery school operate out of the Gilbert Plains Elementary School. Daily Discoveries provide a fun and safe environment for your children and strive for excellent child-care. To find out more about the Gilbert Plains Daycare and Nursery School services and programs, please feel free to send emails to daily@mts.net or direct your calls to 204-548-2274. Gilbert Plains Elementary School provides each student with a safe and caring environment that will promote intellectual growth, creativity and self-discipline. The Elementary School ranges from Kindergarten to Grade 8, and includes a gymnasium, multipurpose room, computer facilities and a library. The Gilbert Plains Collegiate includes Senior 1 to 4. The school has an active extra-curricular program, including volleyball, basketball, badminton, track and field, girls soccer, curling and golf. Students can also participate in student council, yearbook, and Philanthropy Club. VISION (Very Important Stuff I Obviously Need) is a program created by GPCI where students are taught real world applications including basic car maintenance, social media awareness, respect in sport, food safe, and emergency first aid and CPR. As a result of this program, the school board was nominated for the 2017 Premier Award for School Board Initiative. This program is now being considered for other schools in the division and throughout Manitoba. The Gilbert Plains Parent Advisory Council is a group of parents and Gilbert Plains community members that typically meet bimonthly during the school year. They are guided by the MB Association of Parent Councils and work hard to support both the Gilbert Plains Elementary and Gilbert Plains Collegiate Schools. They strive to partner and communicate with parents, school staff groups and the Mountain View School Board Administration to help our community stay informed about the school environments, upcoming events and other issues that may affect our schools and Community. Being a part of this council allows individuals to share ideas for improving student success and school improvement. Participation enables and supports parents and community members by connecting them with each other and their schools. They can learn about the many ways they can show support to our schools and to the development of their child`s education and share ideas for improving student success and school improvement.PAC often coordinates fundraisers through out the school year to support student needs, celebrate student success, and recognize the efforts of the educational staff in our both of our community schools. All PAC positions are voluntary and rely strongly on parental and community support in their efforts. The Gilbert Plains Parent Advisory Council is currently looking for members.